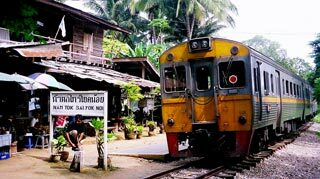 Nakhon Pathom is an easy train stop on the way out of Bangkok to see the highest stupa in the world and visit some wonderful palaces. If you’ve just been to the spectacular Palaces of Bangkok and are not interested in seeing the stupa, Nakhon Pathom may not grab your attention. 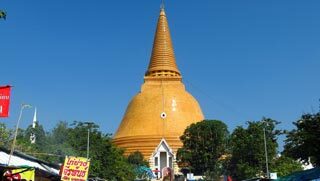 The massive Phra Pathom Chedi and the Sanam Chandra Palace, which is now Nakhon Pathom University’s campus, lies in the beautiful Sanam Chandra Park located in the centre of town. A great relaxing place to get away from the hustle and bustle of a city with 200,000 people. There is also a superb Floating Market worth a visit and Jurassic Water Park nearby, which is be a great afternoon or day out, especially if you have kids and feel like cooling down. The chedi and palace alone are worth a stop here, and we’d recommend staying for a full day if you can. You could just have a quick stop on the way to Kanchanaburi, or if you’re really pushed for time you can actually see the Chedi from the train! 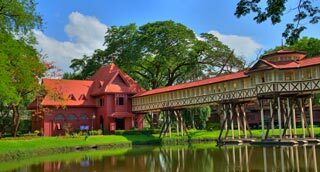 The name of the city in Pali means "First City" and there is little doubt that Nakhon Pathom is indeed Thailand's oldest city, as archaeological remains have been found dating back to 4th century. 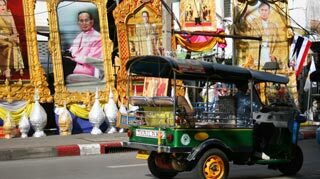 At that time Nakhon Pathom was a coastal city on the route between China and India and is when people from different races settled on the shores. Although Nakhon Pathom was a thriving city many centuries ago, it had all but disappeared until King Rama IV came to Nakhon Pathom as a monk and was inspired to build the highest stupa in the world to mark the birth of Buddhism in his Kingdom. The chedi is now the heart and focal point of modern day Nakhon Pathom.